It is no wonder the public continues to have an on-going love affair with the Costa Del Sol. The beautiful region boasts clear blue skies and sunshine 320 days of the year along with breathtaking coastal and inland scenery, spectacular mountain ranges, the fabulous Mediterranean sea, pretty white washed villages and the friendliest of welcomes from local people. Spain has been popular ever since the 60’s when a well known holiday company introduced the first package breaks to Torremolinos . Since then hundreds of thousands of Brits – along with other European countries – have chosen to set up their permanent or holiday home in Andalucia. 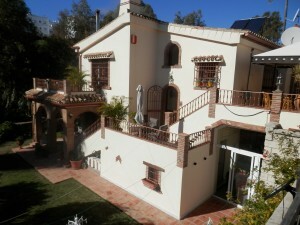 One of the most popular areas is Mijas Costa – the area where we at WOW!! specialise in sales ----which stretches from the picture postcard fishing village of La Cala down to the world famous Marbella and taking in, of course, the Calahonda and Riviera area. It’s the fabulous lifestyle that appeals to most people – the exotic food and drink, the colourful festivals, Flamenco’s and of course we are close to other superb locations such as Gibraltar, North Africa, Portugal, Seville, Granada and the spectacular ski resort of Sierra Nevada, plus many other well known tourist attractions and destinations. It goes without saying that all nationalities feel very much at home here on the Costa Del Sol and the love affair seems set to continue. Everything you could want is on your doorstep from superb international schools and hospitals to a wide choice of continental bars, restaurants, clubs, shops, radio stations, and a selection of daily and weekly newspapers that make it a home from home if you wish. There’s a superb road structure with a network of motorway and toll roads to all the major towns and cities, an excellent rail service with a super-fast high speed link to the Spanish capital of Madrid. The latest improvement will shortly be the new look Malaga Airport where a second terminal will boast 179 check-in desks and have the capacity to handle 9,000 passengers every hour. The second runway – due for completion at the end of 2010 – will almost double existing flight capacity and signals a bright new future for the entire region. The Costa Del Sol will be within easy reach of everyone. And if you are happy at sea, then as well as boasting some outstanding marina’s, Malaga features its own terminal for cruise ships allowing you to cruise to exotic locations from its own port.